The bus shelter is part of the Street Furniture contract approved by the City Council in 2001 with CBS/Decaux, a joint venture of CBS Outdoor and the French advertising giant, J.C. Decaux. 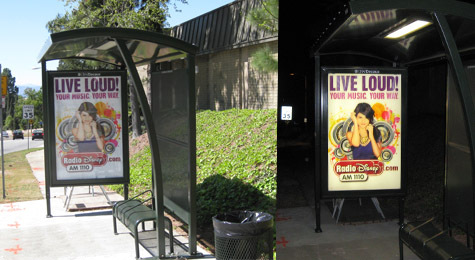 The contract calls for the company to install bus shelters, public amenity kiosks, vending kiosks, and pillars in exchange for a portion of revenue from the commercial advertising on those structures. The Mulholland Scenic Parkway Specific Plan, adopted in 1998, requires all applications for building permits to be considered by a Design Review Board and approved by the director of planning. In a letter issued shortly after the adoption of the plan, then-director Con Howe said that “utility projects by either public agencies or privately-held companies” would be subject to those regulations. The street furniture, which is subject to permits by the city’s department of public works, has generated complaints in such areas as Westwood, Brentwood, Pacific Palisades, and Venice. In 2008, then-councilmember Jack Weiss raised questions about the fact that specific plans, overlay zones, and other local zoning regulations appear to prohibit new off-site advertising signs and in some cases require review by design boards and other agencies for any structures. The City Attorney’s office responded in a letter to the city council’s Public Works Committee that those zoning regulations appeared to only apply to structures on private property, and the street furniture is placed in the public right-of-way. Weiss also questioned the fact that the great majority of the street furniture structures were going up in Council Districts 5 and 11, even though the revenue is split equally between all 15 Council Districts and available for discretionary spending within those districts. Last year, in response to complaints about bus shelter and kiosks appearing without notice in the Venice Coastal Zone Specific Plan area, the staff of the California Coastal Commission issued an opinion that Coastal Development permits were required for the structures. The city’s Board of Public Works is seeking to exempt street furniture from that requirement, but the City Council has not yet acted on the matter. The California Coastal zone has a virtually blanket prohibition on the erection of any new billboards and other forms of off-site advertising.